This authoritative new work analyses European plant intellectual property rights. Whilst the focus of the work is on Europe, and in particular the European Patent Convention, the Council Regulation on Community Plant Variety Rights and the EU Directive on the Legal Protection of Biotechnological Inventions, these provisions are discussed within the context of international legislation, including the Agreement on Trade-Related Aspects of Intellectual Property Rights (TRIPs) and the Convention on Biological Diversity. 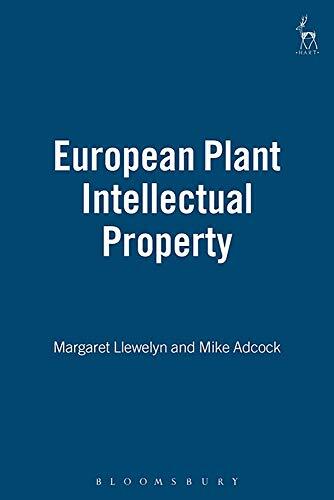 It is the first book to look at the impact of plant intellectual property rights on the European plant breeding industry and assess whether recent developments, such as the Novartis decision, will assist plant breeders, from all sectors of plant breeding activities, in the production of new plant products. In addition to a thorough discussion of the legislation, the book includes unique empirical research results obtained by the authors as part of a two-year research project funded by the European Union, which surveyed attitudes towards, and use of, plant intellectual property rights within the European plant breeding community.